What's on sale. What's NEW! our discounts are for everyone. every day. No coupons needed. 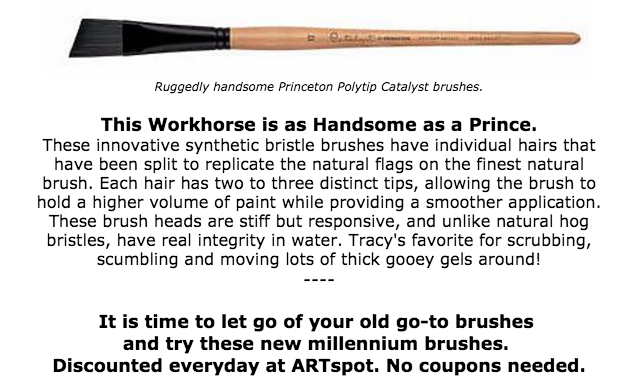 new brush lines at discounted prices: 25-30% off! everyday. No coupons needed. no kidding. Buy Four tubes of Paint Get one Free. We've got crazy good art supplies. You might be surprised at our fair prices, but not surprised at our quality. No coupons because we don't mark things up elsewhere to make up for it. Fair. Local. Cool way to be. Brushes For Watercolor Artists 30% OFF RETAIL EVERYDAY! All Daniel Smith Watercolors Discounted every day! M. Graham Watercolors Discounted every day!! Touch Markers kick the Copic markers for color and reliability. we sell them everyday at $4.50. That’s 40% off Retail! WE NOW HAVE A FULL COLOR SELECTION OF HOLBEIN WATER SOLUBLE OIL PAINTS. IF YOU WANT TO PAINT CLEAN - YOU WILL LOVE THESE SUPERIOR COLORS. we discount 20% OFF LIST PRICES EVERYDAY. 10-20% Off everyday on Gamblin Oils. Deeper discounts on large 150ml tubes! NEW IN! Graham oil paints 30% off everyday. Full line of golden 2oz Heavy Body, Fluid and high flow acrlics. also a good selection of LARGE SIZE 5oz heavy body TUBE. FREE TINT & GLAZE POSTER WITH ANY $100 GOLDEN PURCHASE. Full line of Golden Gels & Mediums. NEW IN! Graham Acrylic paints. Sets and open stock 30% off everyday. Our stretched canvases and cradled birch wood panels are best quality. We have a great selection of large size canvases for the professional artist. We specialize in Heavy Cotton. Our canvases don't buckle or get that wonky bendy thing happening. Better than Blick. Better than "Penny Sale" or coupon canvases. Our canvases are 30-50% off everyday: No coupon needed. REALLY. SO. MUCH. BETTER. Clearance items mixed in all over the store…. just whatever needs to GO! Look for little red tags ending in .99!